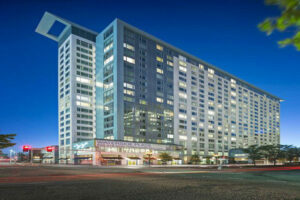 For anyone looking for luxury apartment buildings in Boston, Seaport is one of the first places that come to mind. With so many options, residents have a ton of options to choose from. Most of the communities being built in this coveted area are among Boston’s most luxurious and extravagant as far as amenities and offerings go. 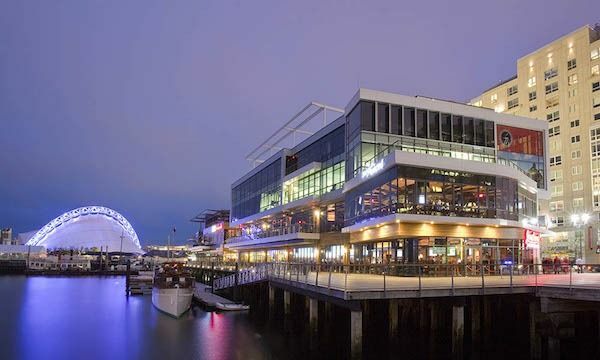 100 Pier 4 embodies the spirit and essence of the Seaport district with its prominent modern architecture and dramatic city and harbor views. Built in 2014, this building offers 337 units of high end luxury living. The high-rise building features 24/7 concierge, underground parking, and electric car charging. It offers amenities such as outdoor sundeck and rooftop pool, a 24 hour state of the art fitness center, yoga studio, business center, walk-in closets, European-style cabinetry, stainless steel appliances, granite countertops and many more amenities to fit your upscale, urban lifestyle. One-bedroom apartments start at $3,491 per month while two-bedroom units start at $3,750 per month. The Benjamin is one the newest high rise buildings in the Seaport district. Here you can experience the ultimate in luxurious apartment living and enjoy breathtaking waterfront and skyline views of the Boston Harbor, the Downtown Boston skyline, Rowe’s Wharf, and Blue Hills. This luxury apartment building features room service, door service, and concierge services. It also features topnotch amenities, captivating modern design and high-end retail featuring The Grand, Scorpion Bar, and Equinox. The units that are offered start at a studio for $2,860 per month and go all the way up to oversize 3 bedroom units at $8,631 per month. The Via is a brand-new complex recently opened in the Seaport district in July 2017. Living at the Via is fun and full of adventure, with close access to local hotspots, restaurants, bars, and more. This luxury building offers stunning views of Fort Point Channel & Boston Harbor. Residents love its modern design with amazing features such as optional garage parking, bike storage, bike share stations and electric vehicle charging stations. It is near the financial district and is in close proximity to MBTA Silver Line Courthouse Station and South Station. It also has easy driving access to I-93 and I-90. A studio unit starts at $3,503 per month and go all the way up to 3 bedroom apartments start at $8,662 per month. 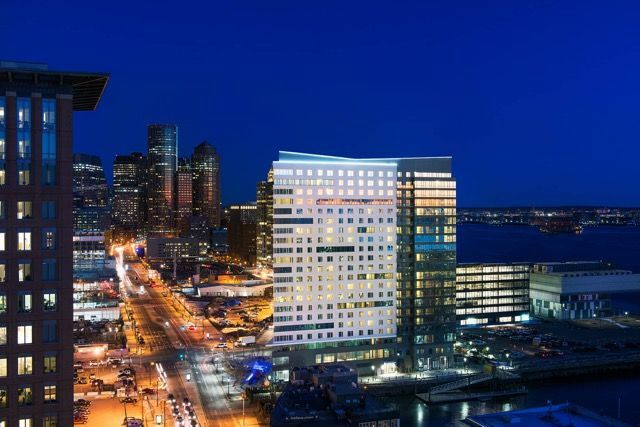 Experience ultimate luxury living at Waterside Place in the Seaport District. It offers the perfect location with close access to the airport and highway. It is located near fantastic dining and entertainment options and has breathtaking views of the harbor and the Boston skyline. These luxury apartments are perfect for anyone who loves modern lifestyle. It boasts amenities such as stainless steel kitchen appliances, oversized 10 foot windows, granite countertops, white wood plank flooring, and in unit washer/dryer. The building also has 24/7 concierge, outdoor sun deck, resident pub with billiards table, and a 24 hours fitness center with yoga deck. One-bedroom apartments start at $2,811 per month. Two-bedroom apartments start at $4,131 per month. 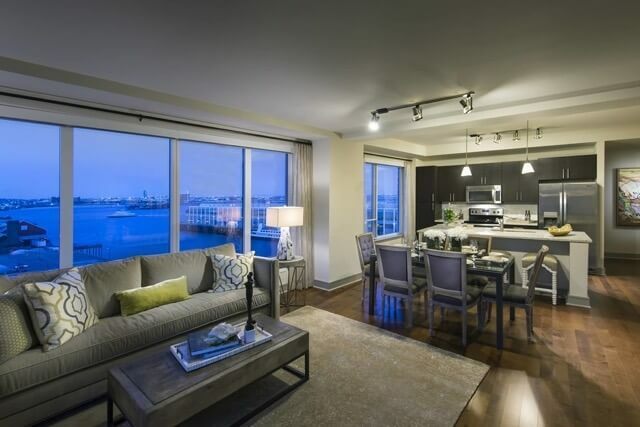 Park Lane Seaport luxury apartment homes is one of the hottest places to live in Boston. It boasts superb service, gorgeous apartment units and perfect location right by the water. Everything you love about Boston is at your fingertips with its amazing harbor & city views, great shops, restaurants and entertaining sites nearby. Park Lane community boasts amenities such as business center, stainless steel appliances, club house, concierge, park, and fitness center. One-bedroom units start at $2,700 per month, while two-bedroom apartments start at $3,800 per month. 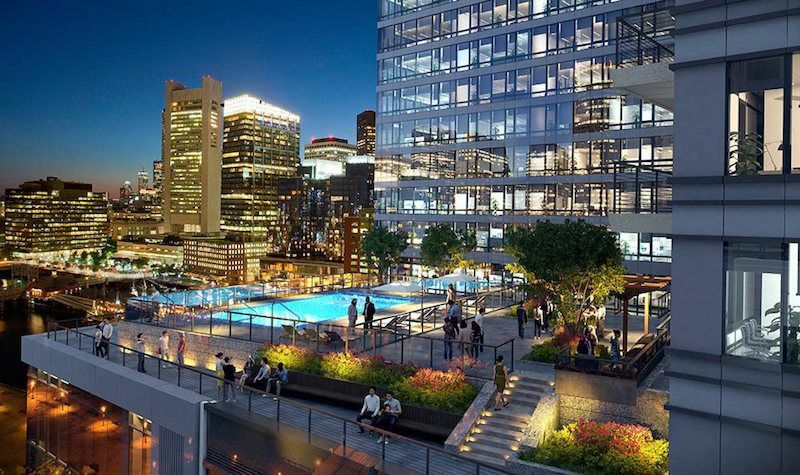 Finding your next luxury apartments in Seaport will be easy & simple if you stick to these 5 luxury apartment buildings. They feature some of the most upscale living options in the city, so you can make the most out of Boston living. For more information on how to rent or buy in one of these top-notch luxury buildings or to schedule a viewing, contact us today!